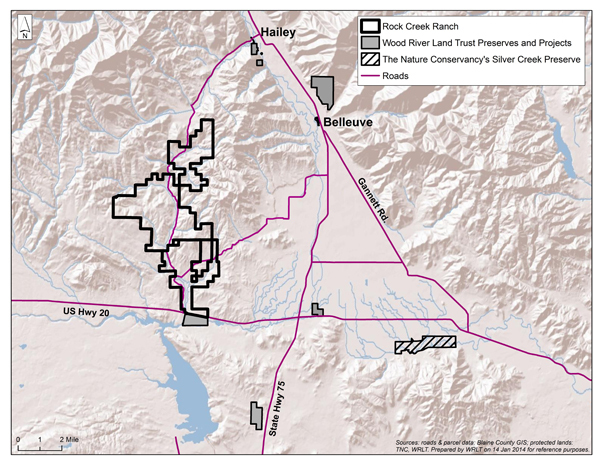 A project to protect 10,400 acres in the southern Wood River Valley for public access under a conservation easement is moving toward completion. The Wood River Land Trust announced this week that it has bought the Rock Creek Ranch from the Rinker family for $2.2 million, and is now waiting for a decision from Blaine County on an application for $1.1 million from the Land, Water and Wildlife program before it takes the final step of selling the property to the Idaho Department of Fish and Game. The recent sale follows purchase of a $3.8 million conservation easement on the property by the Natural Resources Conservation Service as part of the Department of Agriculture’s Grassland Reserve Program. According to the website of the USDA’s Farm Service Agency, the program’s goal is to prevent pasture land from being developed or converted into cropland. According to a news release from the Land Trust, the project expands the bird’s protected habitat in the Pioneer Mountain area to more than 70,000 acres. The last stage in the project will be permanent management of the property as one of the Department of Fish and Game’s 32 wildlife management areas. The department has stated that the primary wildlife goal is to preserve sage-grouse habitat, though the ranch is also an important migration corridor for deer, elk and pronghorn. Combined with about 10,000 acres of surrounding BLM and state land, it will create 32 square miles of open space available for public use. The property stretches from just south of Croy Canyon south to U.S. Highway 20. The project was made possible by a decision by the Rinker family to sell the property for about half their free-market asking price of more than $12 million. Wood River Land Trust Executive Director Scott Boettger said the purchase was funded by $1.1 million of the Land Trust’s money and a $1.1 million loan from The Nature Conservancy. He said the Land, Water and Wildlife money would be used to repay The Nature Conservancy. County Commissioner Larry Schoen said he and Land, Water and Wildlife Project Coordinator Clare Swanger spoke last week with Department of Fish and Game Director Virgil Moore about the proposed sale agreement. Schoen said concerns of the county include assurances that the riparian area of the property, grazed for many years by cattle, be rehabilitated; that access to the creek by cattle be limited; that instream flows be preserved; and that nonlethal deterrent methods be used to protect livestock on the property from predators. Swanger said in an interview that the Land Advisory Board, which makes recommendations to the commissioners on requests for funding from the program, is still reviewing the sale documents. The issue will be put on the commissioners’ meeting agenda once that review is complete. Boettger said that even though the property will be managed to protect wildlife habitat, it will continue as a working ranch. He said a grazing lease with the Purdy family will expire in about a year, and a new management plan will be drawn up then. Boettger emphasized the role that the Rinker family played in enabling the project. Longtime Wood River Valley developer Harry Rinker, in turn, pointed to the role played by his son, Bart Rinker, and Hall & Hall Ranch Brokers partner Trent Jones as being instrumental in putting the project together. Harry Rinker said that of all his philanthropic efforts in the valley, he is most proud of the Rock Creek Ranch project.